This dish bears more than a passing resemblance to this. In fact, if I were to give this post a subtitle, it would be called, The Pad Thai That Isn’t Even Pad Thai But I Don’t Know What To Call It, Take 2. Start with the same creamy sauce, with all the peanutty goodness you can handle, but with a fun new twist – cashews. I ran out of peanuts one day and happened to have chili lime cashews on hand, so into the food processor they went and wowza. Mind. Blown. I also started using half almond butter, half peanut butter as the base of the sauce and it hits the spot always. Next upgrade: be gone rice noodles that stick together and constantly misbehave! Don’t let the door hit you on your way back to the paddy. 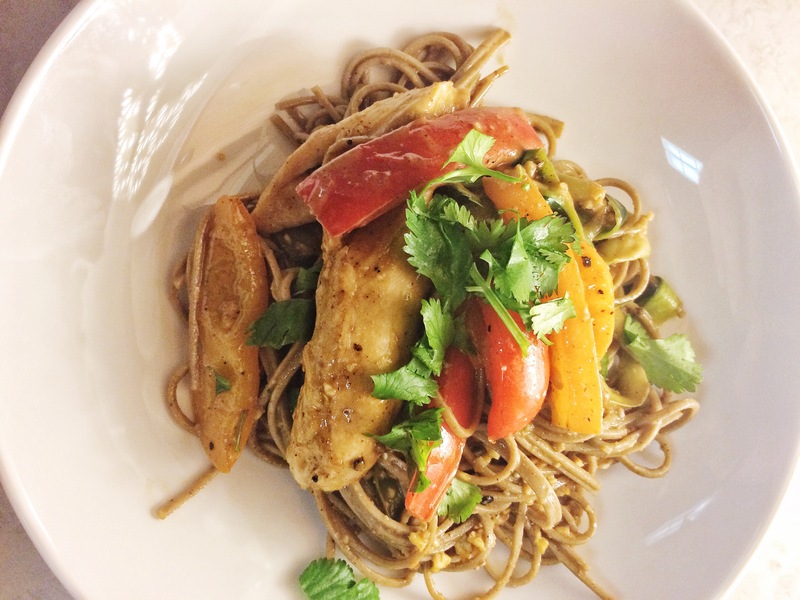 Now, we use buckwheat soba noodles and they add a heartiness that, frankly, rocks. 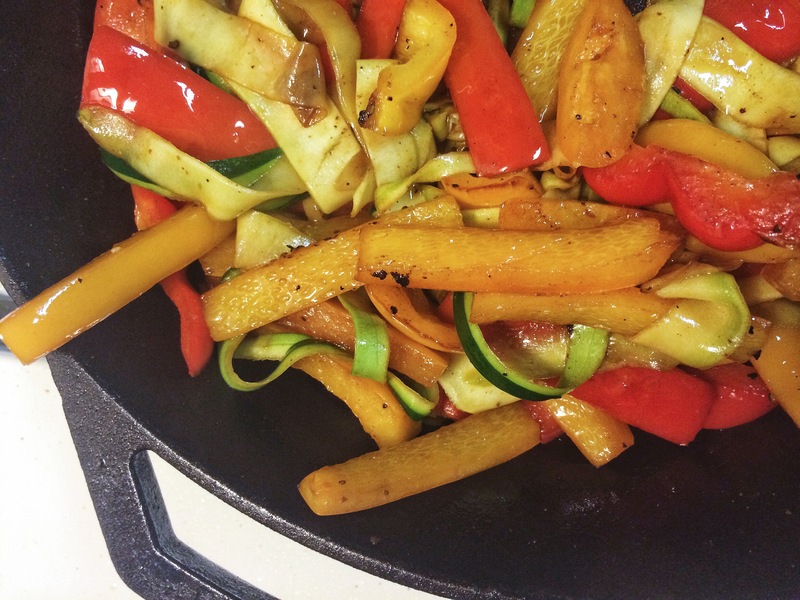 In addition to (or sometimes instead of) julienne carrots, add some lightly sautéed julienne bell peppers. I also mandolin slice a zucchini and it gives the whole dish another texture, but can be slurped and twirled just like the noodles. Finish it off with a really healthy handful of cilantro and you have a gorgeous, colorful dish that is reliably tasty, impresses guests, and will make you want to lick the bowl because it’s so good. And don’t tell Nathan but sometimes, when he’s not looking, I do.
. 1/2 cup of almond butter OR 1/4 cup each almond butter and peanut butter. Up to you. The almond butter only makes this dish a little sweeter, while the peanut butter adds back in a little balance. 1. In a large, pre-heated cast iron skillet, lightly pan fry your chicken, shrimp, or whatever protein you’ve chosen. Sometimes we make this with chicken for a big dinner, other times we go veg and keep things on the lighter side. 2. 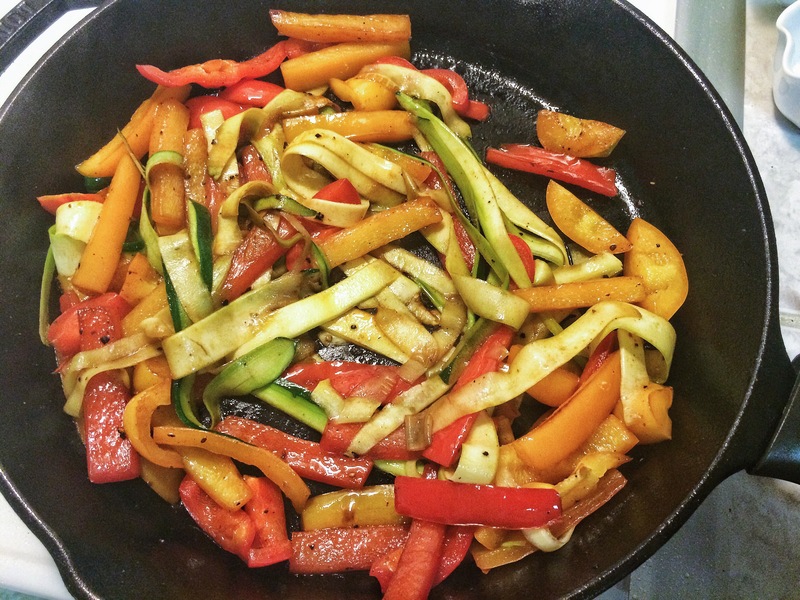 As your protein cooks, put the water on to boil; then julienne bell peppers, mandolin slice zucchini, peel garlic. If you have time, start measuring sauce ingredients and putting them into a food processor. The hardest part of this recipe is that sauce assembly takes awhile because of measuring. 3. Put the noodles into the pot; finish up the sauce assembly and press go! 4. Once your protein is cooked, set it aside (or put it into the oven to keep it warm) and place the peppers into the skillet. Cook to the desired doneness (I like them mostly cooked, but with a tiny bit of bite left, so about five minutes of sauté) and then add the zucchini ‘noodles’ for about a minute. 5. 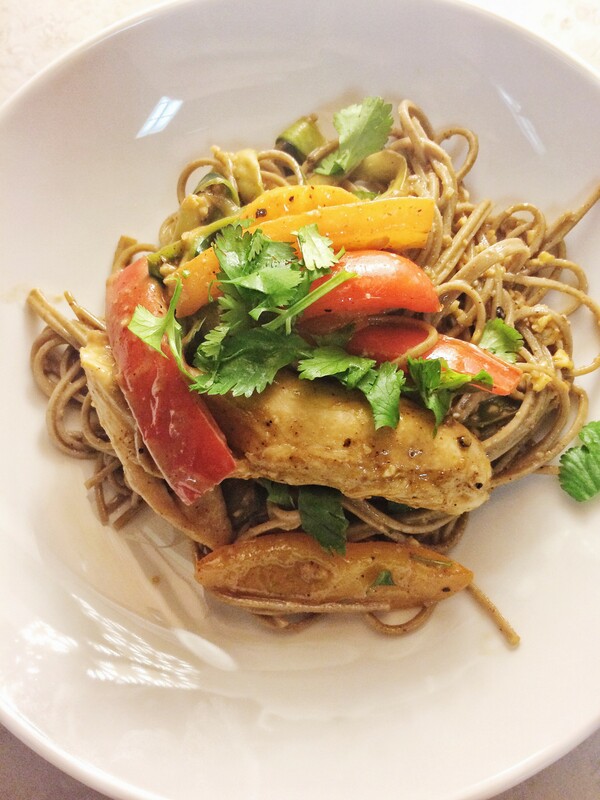 Add 1/4 cup sauce, protein, noodles, and stir! Add more peanut sauce on top if you’d like, and a nice handful of cilantro on top. All photos for this post by Nathan! 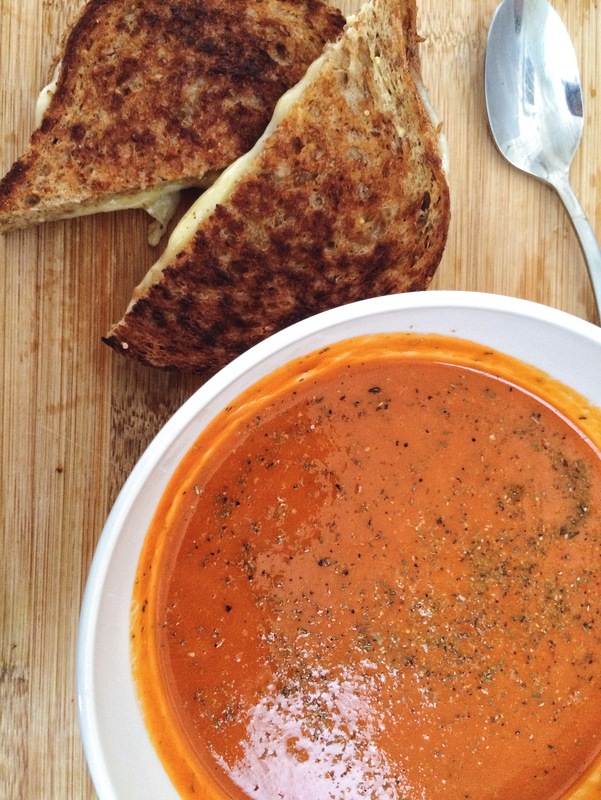 When I was a little kid, there was nothing better than lunch at my grandma’s house: grilled cheese, tomato soup and a dill pickle. 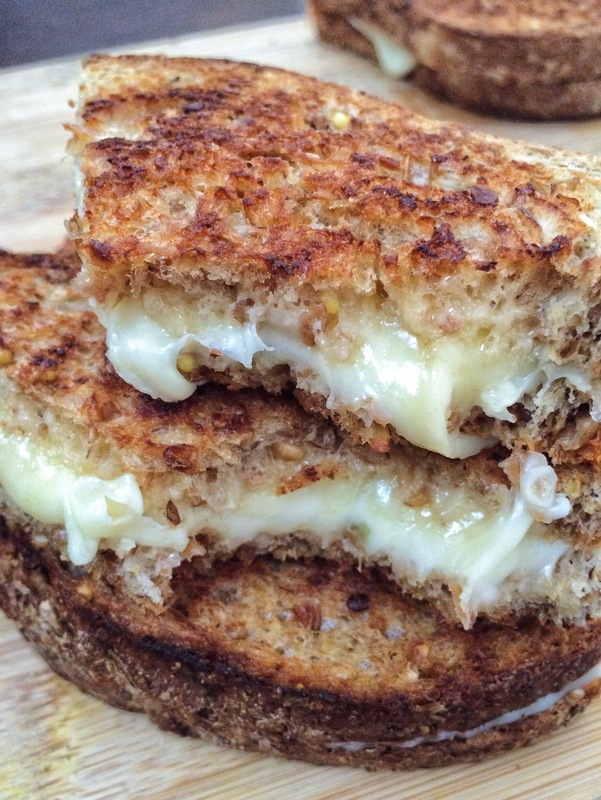 To this day, her sandwiches are the gold standard for what makes a grilled cheese great. First, you start with whole wheat bread, always. Grandma was a nurse and my parents are adorable, PBS-loving suburban hippies – white bread is akin to cocaine in my family. Probably worse. They’d probably rather you live the Bohemian life and try cocaine than eat the evil known as Wonder Bread. There will also be an extra circle in hell reserved for you if you bought that white bread at a Wal-Mart. Grandma always cut thick slabs of sharp cheddar, and then, being the good student of Julia that she was, buttered the heck out of both sides. It sizzled in a nonstick pan for what seemed like an unreasonably long amount of time to a small child (i.e., about 10 minutes). Once it achieved a crunch to rival “that scene” from Chef, it was sliced on the diagonal and served with Campbell’s tomato soup and a giant spear of dill pickle on the side. If we’d been especially well behaved, we would get to wash it all down with a very small mug of root beer. My grandma is no drill sergeant, but she also isn’t the warm and cuddly type of grandma who just doles out the root beer for funsies. NAY, you had to earn that root beer by not pinching your brother. Some days I was more successful with this than others. First, whole wheat bread, always. We like Dave’s Killer Bread, but any sprouted wheat will do. Then, instead of classic cheddar, I spread a medium layer of La Delice de Bourgogne on one side. It’s a rich triple cream French cheese that spreads like buttah, I tell you. Atop the La Delice, I layered very thin slices of Dubliner (a cheese so good I could eat it by the pound), parmesan gouda (a hybrid cheese from Trader Joe’s that is both confusing and confusingly delicious), and topped the whole thing off with a thin deli slice of pepper jack. Because I’m just crazy like that. And also because we’ve been entertaining a lot lately, and we have a lot of leftover cheese nubbins congregating in the back of the fridge. If we’re not careful, they’re going to unionize and start making demands. Good student of Julia that I am, I buttered the heck out of both sides. And then it went into a pre-heated cast iron on medium-low for approximately 10 minutes, until the middle was melty and the outside had that perfect crunch. We ate it with a steaming bowl of roasted red pepper and tomato bisque, and a side of pickles. My grandma isn’t quite strong enough to wield a skillet and whip up a grilled cheese anymore. In fact, I’m not sure that she remembers our lunches or teaching me to cook innumerable things, a thought that makes me sad. And cooking something my grandma taught me makes a simple grilled cheese sandwich one of the loveliest things I know how to cook. 1. Pre-heat a cast iron skillet on low. The trick is to get the skillet to a nice temp so it’s not still heating while you’re cooking. 2. Spread La Delice on one side, then layer up the other cheeses however you like. 3. Lay the pepper jack on top, then close the sandwich. 4. Butter one side well, then place the sandwich butter-side down in the pan. It should meet the skillet with a nice sizzle. While it’s cooking, butter the other side. 5. After about three minutes, flip it. 6. Keep checking to assess for meltiness in the middle and crispness on the outsides. If the sides are browning before the cheese is melting, turn down the skillet. You should see the cheese start to ooze out the sides when it’s done. 7. Cut on the diagonal and serve with a soup and salty garnish of your choosing. A classy glass of lunch wine wouldn’t be totally out of order either. After all, Grandma loves a nice chardonnay almost as much as she likes a good grilled cheese. All photos in this post by Nathan!